The Lockheed U-2, nicknamed "Dragon Lady", is an American single-jet engine, ultra-high altitude reconnaissance aircraft operated by the United States Air Force (USAF) and previously flown by the Central Intelligence Agency (CIA). It provides day and night, high-altitude (70,000 feet; 21,000 m), all-weather intelligence gathering. Lockheed Corporation originally proposed it in 1953, approval followed 1954, and the first test flight occurred in 1955. It was flown during the Cold War over the Soviet Union, China, Vietnam, and Cuba. In 1960, Gary Powers was shot down in a CIA U-2A over the Soviet Union by a surface-to-air missile (SAM). Major Rudolf Anderson Jr. was shot down in another U-2 during the Cuban Missile Crisis in 1962. U-2s have also taken part in post–Cold War conflicts in Afghanistan and Iraq, and supported several multinational NATO operations. The U-2 has also been used for electronic sensor research, satellite calibration, scientific research, and communications purposes. The U-2 is one of a handful of aircraft types to have served the USAF for over 50 years, like the Boeing B-52 and Boeing KC-135. The newest models (TR-1, U-2R, U-2S) entered service in the 1980s with the latest model, the U-2S, receiving its technical upgrade in 2012. After World War II, the U.S. military desired better strategic aerial reconnaissance to help determine Soviet capabilities and intentions. Into the 1950s, the best intelligence the American government had on facilities deep inside the Soviet Union were German Luftwaffe photographs taken during the war of territory west of the Ural Mountains, so overflights to take aerial photographs of the Soviet Union began. After 1950, Soviet air defenses aggressively attacked all aircraft near the country's borders—sometimes even those over Japanese airspace—and the existing reconnaissance aircraft, primarily bombers converted for reconnaissance duty such as the Boeing RB-47, were vulnerable to anti-aircraft artillery, missiles, and fighters. Richard Leghorn of the USAF suggested that an aircraft that could fly at 60,000 feet (18,300 m) should be safe from the MiG-17, the Soviet Union's best interceptor, which could barely reach 45,000 feet (13,700 m). He and others believed that Soviet radar, which used American equipment provided during the war, could not track aircraft above 65,000 feet (19,800 m). The highest-flying aircraft available to America and its allies at the time was the English Electric Canberra, which could reach 48,000 feet (14,600 m). The British had already produced the PR3 photo-reconnaissance variant, but the USAF asked for English Electric's help to further modify the Martin B-57 (the American licensed version of the Canberra) with long, narrow wings, new engines, and a lighter-than-normal airframe to reach 67,000 feet (20,400 m). Air Research and Development Command mandated design changes that made the aircraft more durable for combat, but the resulting RB-57D aircraft of 1955 could only reach 64,000 feet (19,500 m). The Soviet Union, unlike the United States and Britain, had improved radar technology after the war, and could track aircraft above 65,000 feet (19,800 m). It was thought that an aircraft that could fly at 70,000 feet (21,300 m) would be beyond the reach of Soviet fighters, missiles, and radar. Another USAF officer, John Seaberg, wrote a request for proposal in 1953 for an aircraft that could reach 70,000 feet (21,300 m) over a target with 1,500 nmi (1,700 mi; 2,800 km) of operational radius. The USAF decided to solicit designs only from smaller aircraft companies that could give the project more attention. Under the code name "Bald Eagle", it gave contracts to Bell Aircraft, Martin Aircraft, and Fairchild Engine and Airplane to develop proposals for the new reconnaissance aircraft. Officials at Lockheed Aircraft Corporation heard about the project and decided to submit an unsolicited proposal. To save weight and increase altitude, Lockheed executive John Carter suggested that the design eliminate landing gear and avoid attempting to meet combat load factors for the airframe. The company asked Clarence "Kelly" Johnson to come up with such a design. Johnson was Lockheed's best aeronautical engineer, responsible for the P-38 and the P-80. He was also known for completing projects ahead of schedule, working in a separate division of the company, informally called the Skunk Works. Johnson's design, named CL-282, was based on the Lockheed XF-104 with long, slender wings and a shortened fuselage. The design was powered by the General Electric J73 engine and took off from a special cart and landed on its belly. It could reach an altitude of 73,000 feet (22,300 m) and had a 1,600 mi (1,400 nmi; 2,600 km) radius. The reconnaissance aircraft was essentially a jet-powered glider. In June 1954, the USAF rejected the design in favor of the Bell X-16 and the modified B-57. Reasons included the lack of landing gear, use of the J73 engine instead of the more proven Pratt & Whitney J57 (like the competing designs), and not using multiple engines, which, the USAF believed, was more reliable. General Curtis LeMay of Strategic Air Command (SAC) walked out during a CL-282 presentation, saying that he was not interested in an airplane without wheels or guns. Civilian officials including Trevor Gardner, an aide to Secretary of the Air Force Harold E. Talbott, were more positive about the CL-282 because of its higher potential altitude and smaller radar cross section, and recommended the design to the Central Intelligence Agency's Office of Scientific Intelligence. At that time,[when?] the CIA depended on the military for overflights, and Director of Central Intelligence Allen Dulles favored human over technical intelligence gathering methods. However, the Intelligence Systems Panel, a civilian group advising the USAF and CIA on aerial reconnaissance, had recognized by 1954 that the RB-57D would not meet the 70,000 feet (21,300 m) requirement that panel member Allen Donovan of Cornell Aeronautical Laboratory believed was necessary for safety. 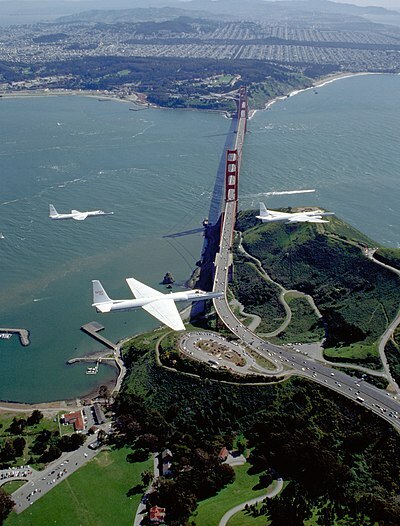 The CIA told the panel about the CL-282, and the aspects of its design that the USAF saw as flaws (the single engine and light load factor) appealed to Donovan, a sailplane enthusiast who believed that a sailplane was the type of high-altitude aircraft the panel was seeking. Edwin Land, the developer of instant photography, and another member of the panel proposed to Dulles through Dulles' aide, Richard M. Bissell Jr., that his agency should fund and operate this aircraft. Land believed that the military operating the CL-282 during peacetime could provoke a war. Although Dulles remained reluctant to have the CIA conduct its own overflights, Land and James Killian of MIT told President Eisenhower about the aircraft; Eisenhower agreed that the CIA should be the operator. Dulles finally agreed, but some USAF officers opposed the project because they feared it would endanger the RB-57D and X-16. 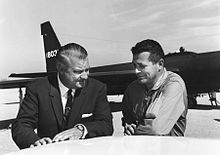 The USAF's Seaberg helped persuade his own agency to support the CL-282, albeit with the higher-performance J57 engine, and final approval for a joint USAF-CIA project (the first time the CIA dealt with sophisticated technology) came in November 1954. Lockheed had meanwhile become busy with other projects and had to be persuaded to accept the CL-282 contract after approval. Bissell became head of the project, which used covert funding; under the Central Intelligence Agency Act of 1949, the CIA's director is the only federal government employee who can spend "un-vouchered" government money. Lockheed received a $22.5 million contract (equivalent to $210.4 million today) in March 1955 for the first 20 aircraft, with the first $1.26 million ($11.78 million today) mailed to Johnson's home in February 1955 to keep work going during negotiations. The company agreed to deliver the first aircraft by July of that year and the last by November 1956. It did so, and for $3.5 million ($32.3 million today) under budget. The Flight Test Engineer in charge was Joseph F. Ware Jr.
Procurement of the aircraft's components occurred secretly. When Johnson ordered altimeters calibrated to 80,000 feet (24,400 m) from a company whose instruments only went to 45,000 feet (13,700 m), the CIA set up a cover story involving experimental rocket aircraft. Shell Oil developed a new low-volatility, low vapor pressure jet fuel that would not evaporate at high altitudes; the fuel became known as JP-7, and manufacturing several hundred thousand gallons for the aircraft in 1955 caused a nationwide shortage of Esso's FLIT insect repellent. The aircraft was renamed the U-2 in July 1955, the same month the first aircraft, Article 341, was delivered to Groom Lake. The "U" referred to the deliberately vague designation "utility" instead of "R" for "reconnaissance", and the U-1 and U-3 aircraft already existed. The CIA assigned the cryptonym AQUATONE to the project, with the USAF using the name OILSTONE for their support to the CIA. James Baker developed the optics for a large-format camera to be used in the U-2 while working for Perkin-Elmer. The new camera had a resolution of 2.5 feet (76 cm) from an altitude of 60,000 feet (18,000 m). The aircraft was so crowded that when Baker asked Johnson for six more inches (15 cm) of space for a lens with a 240-inch (610 cm) focal length, Johnson replied "I'd sell my grandmother for six more inches! "; Baker instead used a 180-inch (460 cm) f/13.85 lens in a 13 in × 13 in (33 cm × 33 cm) format for his final design. The U-2 has used Jet Propellant Thermally Stable (JPTS) since the aircraft's development in the 1950s. JPTS is a high thermal stability, high altitude fuel, created specifically as fuel for the U-2. JPTS has a lower freeze point, higher viscosity, and higher thermal stability than standard Air Force fuels. In 1999, the United States Air Force spent approximately $11.3 million (equivalent to $17.0 million today) on fuel for the U-2 aircraft and was looking for a lower cost alternative. JPTS is a specialty fuel and as such has limited worldwide availability and costs over three times the per-gallon price of the Air Force's primary jet fuel, JP-8. Research is under way to find a cheaper and easier alternative involving additives to generally used jet fuels. A JP-8 based alternative, JP-8+100LT, is being considered. JP-8+100 has increased thermal stability by 100 °F (56 °C) over stock JP-8, and is only 0.5 cents per gallon more expensive; low temperature additives can be blended to this stock to achieve desired cold performance. Due to the small landing gear, a perfect balance in the fuel tanks was essential for a safe landing. Similarly to sailplanes, the U-2 had a yaw string on the canopy to detect slip or skid during the approach. A skid during flight with no bank was the hint of an unbalance around the longitudinal axis which could be resolved by moving the fuel to the left or right wing tank. When the first overflights of the Soviet Union were tracked by radar, the CIA initiated Project Rainbow to reduce the U-2's radar cross-section. This effort ultimately proved unsuccessful, and work began on a follow-on aircraft, which resulted in the Lockheed A-12 Oxcart. The design that gives the U-2 its remarkable performance also makes it a difficult aircraft to fly. Martin Knutson said that it "was the highest workload air plane I believe ever designed and built ... you're wrestling with the air plane and operating the camera systems at all times", leaving no time to "worry about whether you're over Russia or you're flying over southern California". The U-2 was designed and manufactured for minimum airframe weight, which results in an aircraft with little margin for error. Most aircraft were single-seat versions, with only five two-seat trainer versions known to exist. Early U-2 variants were powered by Pratt & Whitney J57 turbojet engines. The U-2C and TR-1A variants used the more powerful Pratt & Whitney J75 turbojet. The U-2S and TU-2S variants incorporated the more powerful General Electric F118 turbofan engine. High aspect ratio wings give the U-2 some glider-like characteristics, with an engine out glide ratio of about 23:1, comparable to gliders of the time. To maintain their operational ceiling of 70,000 feet (21,000 m), the early U-2A and U-2C models had to fly very near their never-exceed speed (VNE). The margin between that maximum speed and the stall speed at that altitude was only 10 knots (12 mph; 19 km/h). This narrow window is called the "coffin corner", because breaching either limit would likely cause airflow separation at the wings or tail. For most of the time on a typical mission the U-2 was flying less than five knots (6 mph; 9 km/h) above stall speed. A stall would cause a loss of altitude, possibly leading to detection and overstress of the airframe. The U-2's flight controls are designed for high-altitude flight; the controls require light control inputs at operational altitude. However, at lower altitudes, the higher air density and lack of a power assisted control system makes the aircraft very difficult to fly. Control inputs must be extreme to achieve the desired response, and a great deal of physical strength is needed to operate the controls in this manner. The U-2 is very sensitive to crosswinds, which, together with its tendency to float over the runway, makes the aircraft notoriously difficult to land. As it approaches the runway, the cushion of air provided by the high-lift wings in ground effect is so pronounced that the U-2 will not land unless the wing is fully stalled. A landing U-2 is accompanied on the ground by a chase car and an assisting U-2 pilot calling off the angles and decreasing aircraft height as the aircraft descends. In practice, once the aircraft has descended to an altitude of two feet (0.61 m) above the tarmac the pilot initiates a stall and the aircraft falls from this height. Chase cars and live calling of aircraft altitude are necessary because the landing gear is not designed to absorb the weight of the aircraft when falling from altitudes much above two feet (0.61 m). Instead of the typical tricycle landing gear, the U-2 uses a bicycle configuration with a forward set of main wheels located just behind the cockpit, and a rear set of main wheels located behind the engine. The rear wheels are coupled to the rudder to provide steering during taxiing. To maintain balance while taxiing and take-off, two auxiliary wheels called "pogos" are attached under the wings. These fit into sockets underneath each wing at about mid-span, and fall off at takeoff. To protect the wings during landing, each wingtip has a titanium skid. After the U-2 comes to a halt, the ground crew re-installs the pogos in one wing at a time, then the aircraft taxis to parking. Because of the high operating altitude and the cockpit's partial pressurization, equivalent to 28,000 feet (8,500 m) pressure altitude, the pilot wears a partially pressurized space suit, which delivers the pilot's oxygen supply and provides emergency protection in case cabin pressure is lost. While pilots can drink water and eat various liquid foods in squeezable containers through a self-sealing hole in the face mask, they typically lose up to 5% of their body mass on an eight-hour mission. Most pilots chose to not take with them the suicide pill offered before missions. If put in the mouth and bitten, the "L-pill"—containing liquid potassium cyanide—would cause death in 10–15 seconds. After a pilot almost accidentally ingested an L-pill instead of candy during a December 1956 flight, the suicide pills were put into boxes to avoid confusion. When in 1960 the CIA realized that a pill breaking inside the cockpit would kill the pilot, it destroyed the L-pills, and as a replacement its Technical Services Division developed a needle poisoned with a powerful shellfish toxin and hidden in a silver dollar. Only one was made because, as the agency decided, if any pilot needed to use it the program would probably be canceled. Like the suicide pill, not all pilots carried the coin, and Knutson did not know of any that intended to commit suicide; he carried it as an escape tool. To decrease the risk of developing decompression sickness, pilots breathe 100% oxygen for an hour prior to take off to remove nitrogen from the blood. A portable oxygen supply is used during transport to the aircraft. Since 2001, more than a dozen pilots have reportedly suffered the effects of decompression sickness, including permanent brain damage in nine cases; initial symptoms include disorientation and becoming unable to read. Factors increasing the risk of illness since 2001 include longer mission durations and more cockpit activity. Conventional reconnaissance missions would limit pilot duties to maintaining flight path for camera photography. Operations over Afghanistan included more real time activities, such as communication with ground troops, increasing their bodies' oxygen requirements and the risk of nitrogen bubble formation. U-2 pilots now exercise during oxygen pre-breathing. In 2012, modifications were initiated under the Cockpit Altitude Reduction Effort (CARE), increasing the cabin pressure from 3.88 psi to 7.65 psi, a 15,000-foot (4,600 m) altitude equivalent. The urine collection device also was rebuilt to eliminate leakage. Initial missions were flown with the trimetrogon "A" camera, a modification of existing cameras, consisting of three 24-inch-focal-length (610 mm) cameras. This was followed by the "B" camera with a 36-inch-focal-length (910 mm) lens and image motion compensation. It was a panoramic camera which took pictures of an extremely large area of the earth's surface. Six-thousand-foot (1,800 m) reels of film made from ESTAR Base (PET) were used. The aircraft carries a variety of sensors in the nose, Q-bay (behind the cockpit, also known as the camera bay), and wing pods. The U-2 is capable of simultaneously collecting signals, imagery intelligence and air samples. Imagery intelligence sensors include either wet film photography, electro-optic, or radar imagery–the latter from the Raytheon ASARS-2 system. It can use both line-of-sight and over-horizon data links. Though the USAF and the Navy would eventually fly the U-2, the CIA had majority control over the project, code named Project DRAGON LADY. Despite SAC chief LeMay's early dismissal of the CL-282, the USAF in 1955 sought to take over the project and put it under SAC until Eisenhower repeated his opposition to military personnel flying the aircraft. Nonetheless, the USAF substantially participated in the project; Bissell described it as a "49 percent" partner. The USAF agreed to select and train pilots and plot missions, while the CIA would handle cameras and project security, process film, and arrange foreign bases. Beyond not using American military personnel to fly the U-2, Eisenhower preferred to use non-US citizens. Seven Greek pilots and a Polish expatriate were added to the U-2 trainees although only two of the Greek pilots were subsequently allowed to fly the aircraft. Their flight proficiency was poor. The language barrier and a lack of appropriate flying experience proved problematic; by late 1955, foreign pilots had been dropped from the program. USAF pilots had to resign their military commissions before joining the agency as civilians, a process referred to as "sheep dipping", and were always called "drivers", not pilots. The program only recruited fighter pilots with reserve USAF commissions, as regular commissions complicated the resignation process. The program offered high salaries and the USAF promised that pilots could return at the same rank as their peers. The CIA's standards for selection were higher than the USAF's once the latter began its own U-2 flights; although more candidates were rejected, the CIA's program had a much lower accident rate. Test pilot Tony LeVier trained other Lockheed pilots to fly the U-2. By September 1955 he had trained six USAF pilots, who in turn trained other "sheep-dipped" pilots. As no two-seat trainer model was available for the program's first 15 years, training was done before the trainee's first solo flight and via radio. Pilots had to adjust to the U-2's unusual combination of jet engines and enormous, high-lift glider wings; because of the "coffin corner" they learned of the need to pay complete attention to flying when not using the autopilot. Pilot view within the U-2 cockpit. Note the use of a high-pressure suit worn by pilot, similar to that used by the aircraft's successor, the Lockheed SR-71. As with CIA involvement, besides the normal serial number for each aircraft produced, each U-2 also has an "article number" assigned, and each U-2 would be referred to with its article number on classified internal documents. The prototype U-2, Article 341, never received a USAF serial. The first flight occurred at Groom Lake on 1 August 1955, during what was intended to be only a high-speed taxi test. The sailplane-like wings were so efficient that the aircraft jumped into the air at 70 knots (81 mph; 130 km/h), amazing LeVier who, as he later said, "had no intentions whatsoever of flying". The lake bed had no markings making it difficult for LeVier to judge the distance to the ground, and the brakes proved too weak; he bounced the U-2 once before it stopped rolling. Although the aircraft suffered only minor damage, LeVier again found landing the U-2 difficult during the actual first test flight three days later. On his sixth try, he found that landing the aircraft by touching down on the rear wheel first was superior to making the initial touchdown with the front wheel. Pilots continued to have difficulty during landing, due to the ground effect holding the aircraft off the runway for long distances. On a test flight on 8 August, the U-2 reached 32,000 feet (9,800 m), proving that Johnson had met his promised specifications and deadline. By 16 August, the prototype flew at 52,000 feet (15,800 m), an altitude never before reached in sustained flight; by 8 September, it reached 65,000 feet (19,800 m). By January 1956, the U-2 had so impressed the USAF that it decided to obtain its own aircraft. The USAF purchased a total of 31 U-2s through the CIA; the transaction's code name, Project DRAGON LADY, was the origin of the aircraft's nickname. Meanwhile, U-2s conducted eight overflights of the U.S. in April 1956, convincing project overseers that the aircraft was ready for deployment. As often happens with new aircraft designs, there were several operational accidents. One occurred during these test flights, when a U-2 suffered a flameout over Tennessee; the pilot calculated that he could reach New Mexico. Every air base in the continental U.S. had sealed orders on what to do if a U-2 landed. The commander of Kirtland Air Force Base near Albuquerque, New Mexico was told to open his orders, prepare for the arrival of an unusual aircraft making a deadstick landing, and get it inside a hangar as soon as possible. The U-2 successfully landed after gliding for more than 300 miles (480 km), and its strange, glider-like appearance and the space-suited pilot startled the base commander and other witnesses. Not all U-2 incidents would be so benign, with three fatal accidents occurring in 1956 alone. The first fatal accident was on 15 May 1956, when the pilot stalled the aircraft during a post-takeoff maneuver that was intended to drop off the wingtip outrigger wheels. The second occurred on 31 August, when the pilot stalled the aircraft immediately after takeoff. On 17 September, a third aircraft disintegrated during ascent in Germany, also killing the pilot. There were other non-fatal incidents, including at least one that resulted in the loss of the aircraft. A committee of Army, Navy, Air Force, CIA, NSA, and State Department representatives created lists of priority targets for U-2 and other intelligence-gathering methods. The U-2 project received the list and drew up flight plans, and the committee provided a detailed rationale for each plan for the president to consider as he decided whether to approve it. The CIA's Photo Intelligence Division grew in size to prepare for the expected flood of U-2 photographs. Before the aircraft became operational, however, the air force's Project Genetrix, which used high-altitude balloons to photograph the Soviet Union, China, and eastern Europe, led to many diplomatic protests from those countries and for a while CIA officials feared that the U-2 project was at risk. While Genetrix was also a technical failure—only 34 of the 516 balloons returned usable photographs—the balloon flights gave the United States many clues on how the Communist countries used radar to track overflights, which benefited the U-2 program. With approval from the National Advisory Committee for Aeronautics (NACA)'s director Hugh Dryden, Bissell's team at the CIA developed a cover story for the U-2 that described the aircraft as used by NACA for high-altitude weather research; the cover story would be used if the aircraft were lost over hostile territory. To support the story, U-2s took weather photographs that appeared in the press on several occasions. The civilian advisers Land and Killian disagreed with the cover story, advising that in case of an aircraft loss, the United States forthrightly acknowledge its use of U-2 overflights "to guard against surprise attack". Their advice was not followed, and the weather cover story led to the disaster that followed the May 1960 U-2 loss. The British government in January 1956 approved the U-2's deployment from RAF Lakenheath. NACA announced that the USAF Air Weather Service would use a Lockheed-developed aircraft to study the weather and cosmic rays at altitudes up to 55,000 feet; accordingly, the first CIA detachment of U-2s ("Detachment A") was known publicly as the 1st Weather Reconnaissance Squadron, Provisional (WRSP-1). The death in April 1956, however, of British agent Lionel Crabb while examining Soviet ships in Portsmouth harbor embarrassed the British government, which asked the United States to postpone the Lakenheath flights. To avoid delays, in June 1956, Detachment A moved to Wiesbaden, Germany, without approval from the German government, while Giebelstadt Army Airfield was prepared as a more permanent base. Eisenhower remained concerned that despite their great intelligence value, overflights of the Soviet Union might cause a war. While the U-2 was under development, at the 1955 Geneva Summit he proposed to Nikita Khrushchev that the Soviet Union and the United States would each grant the other country airfields to use to photograph military installations. Khrushchev rejected the "Open Skies" proposal, and the CIA told the president that the Soviets could not track high altitude U-2 flights. This belief was based on studies using old Soviet radar systems and American systems that were not as effective at high altitudes as current Soviet systems, of which the U.S. was not aware; Knutson later said that "the U-2 was really quite invisible to American radar, but Russian radar were a little different – better, you might say". Although the Office of Scientific Intelligence issued a more cautious report in May 1956 that stated that detection was possible, it believed that the Soviets could not consistently track the aircraft. Dulles further told Eisenhower (according to presidential aide Andrew Goodpaster) that in any aircraft loss the pilot would almost certainly not survive. With such assurances and the growing demand for accurate intelligence regarding the alleged "bomber gap" between the U. S. and the Soviet Union, in June 1956 Eisenhower approved 10 days of overflights. The first U-2 overflight had already occurred, using existing authorization of air force overflights over Eastern Europe. On 20 June 1956 a U-2 flew over Poland and East Germany, with more flights on 2 July. The fact that radar had—contrary to the CIA's expectations—successfully tracked the aircraft worried Eisenhower, but he approved the first Soviet overflight, Mission 2013 on 4 July. U-2 Article 347's main target was the Soviet submarine construction program in Leningrad, as well as counting the numbers of the new Myasishchev M-4 "Bison" bomber. A second flight on 5 July continued searching for Bisons, took photographs of Moscow (the only ones taken by the program), and examined rocket factories at Kaliningrad and Khimki. Eisenhower knew from the earlier overflights that his hope of no Soviet detection was unrealistic, but ordered that the overflights stop if the aircraft could be tracked. The CIA found that the Soviets could not consistently track the U-2s, and they therefore did not know that Moscow and Leningrad had been overflown. The aircraft's photographs showed tiny images of MiG-15s and MiG-17s attempting and failing to intercept the aircraft, proving that the Soviets could not shoot down an operational U-2. Knutson recalled that the "constant stream of Russian fighters" trying to shoot down the U-2 during overflights was sometimes "so thick" that they interfered with photographs. Repeatedly failing for years to stop the aircraft embarrassed the USSR, which made diplomatic protests against the flights but did not publicize the penetration of Soviet territory. U-2 missions from Wiesbaden would depart westward in order to gain altitude over friendly territory before turning eastward at operational altitudes. The NATO Air Defence mission in that area included No. 1 Air Division RCAF (Europe), which operated the Canadair Sabre Mark 6 from bases in northeastern France. This aircraft had a service ceiling of 54,000 feet and numerous encounters between the U-2 and RCAF 'ZULU' alert flights have been recorded for posterity. On 10 July, the Soviets protested what they described as overflights by a USAF "twin-engine medium bomber", apparently believing that it was a Canberra. The U.S. replied on 19 July that no American "military planes" had overflown the Soviet Union, but the fact that the Soviets' report showed that they could track the U-2s for extended periods caused Eisenhower to immediately halt overflights over eastern Europe. Beyond the Soviet protests, the president was concerned about American public reaction to news that the U.S. had violated international law. To avoid project cancellation, the CIA began Project Rainbow to make the U-2 less detectable. The eight overflights over communist territory, however, had already shown that the bomber gap did not exist; the U-2s had not found any Myasishchev M-4 Bison bombers at the nine bases they had visited. Because the Eisenhower administration could not disclose the source of its intelligence, however, Congressional and public debate over the bomber gap continued. The presidential order did not restrict U-2 flights outside eastern Europe. In May 1956, Turkey approved the deployment of Detachment B at Incirlik Air Base, near Adana, Turkey. Before the new detachment was ready, however, Detachment A in late August used Adana as a refueling base to photograph the Mediterranean. The aircraft found evidence of many British troops on Malta and Cyprus as the United Kingdom prepared for its forthcoming intervention in Suez. The U.S. released some of the photographs to the British government. As the crisis grew in seriousness, the project converted from a source of strategic reconnaissance, which prioritized high quality over speed (the film was processed by its maker, then analyzed in Washington), to a tactical reconnaissance unit that provided immediate analysis. The Photo Intelligence Division set up a lab at Wiesbaden; as Detachment B took over from A and flew over targets that remain classified as of July 2013[update], the Wiesbaden lab's rapid reports helped the U.S. government to predict the Israeli-British-French attack on Egypt three days before it began on 29 October. On 1 November a flight flew over the Egyptian air base at Almaza twice, 10 minutes apart; in between the British and French attacked the base, and the visible results of the attack in the "10-minute reconnaissance" impressed Eisenhower. Beginning on 5 November, flights over Syria showed that the Soviets had not sent aircraft there despite their threats against the British, French and Israelis, a cause of worry for the U.S.
Eisenhower refused CIA pleas in September 1956 to reauthorize overflights of Eastern Europe but the Hungarian Revolution in November, and his reelection that month, caused the president to permit flights over border areas. Soviet interceptors continued to fail to reach the U-2s but, after the Soviets protested a December overflight of Vladivostok by RB-57Ds, Eisenhower again forbade communist overflights. Flights close to the border continued, now including the first ELINT-equipped U-2s. In May 1957, Eisenhower again authorized overflights over certain important Soviet missile and atomic facilities. He continued to personally authorize each flight, closely examining maps and sometimes making changes to the flight plan. By 1957, one of the European units was based at Giebelstadt, and the far eastern unit was based at the Naval Air Facility Atsugi, Japan. Part of the reason for the May reauthorization was that the CIA promised that improvements from Project RAINBOW would make the majority of U-2 flights undetected. On 2 April 1957, a RAINBOW test flight crashed in Nevada, killing the pilot. The U-2's large wingspan slowed its descent during crashes, often leaving its remains salvageable; Lockheed was able to rebuild the wreckage from the incident into a flyable airframe, but that it could do so should have been evidence to the CIA that its cover story might not be viable after a crash in hostile territory. The RAINBOW anti-radar modifications were not very successful, and their use ended in 1958. Soviet overflights resumed in June 1957 from Eielson Air Force Base in Alaska to the Russian Far East, which had less effective radar systems. Others originated from Lahore, Pakistan. A Lahore flight on 5 August provided the first photographs of the Baikonur Cosmodrome near Tyuratam: the CIA had been unaware of its existence until then. Other flights examined the Semipalatinsk nuclear test site and the Saryshagan missile test site. After a few more overflights that year, only five more would occur before the May 1960 incident because of Eisenhower's increasing caution. The president sought to avoid angering the Soviets as he worked to achieve a nuclear test ban; meanwhile the Soviets began trying to shoot down U-2 flights that never entered Soviet airspace, and the details in their diplomatic protests showed that Soviet radar operators were able to effectively track the aircraft. To reduce visibility Lockheed painted the aircraft in a blue-black color that helped them blend in against the darkness of space, and the CIA aircraft received the more powerful Pratt & Whitney J75-P-13 engine that increased maximum altitude by 2,500 feet (800 m), to 74,600 feet (22,700 m). The Soviets developed their own overflight aircraft, variants of the Yak-25, which in addition to photographing various parts of the world through the early 1960s acted as a target for the new MiG-19 and MiG-21 interceptors to practice for the U-2. In April 1958, CIA source Pyotr Semyonovich Popov told his handler George Kisevalter that a senior KGB official had boasted of having "full technical details" of the U-2, leading Bissell to conclude the project had a leak. The source of the leak was never identified, although there was speculation that it was Lee Harvey Oswald, then a radar operator at a U-2 base in Japan. The successful launch of Sputnik 1 on 4 October 1957 gave credence to Soviet claims about the progress of its intercontinental ballistic missile program, and began the Sputnik crisis in the United States. The U-2 intelligence caused Eisenhower to state in a press conference on 9 October that the launch did "not raise my apprehensions, not one iota", but he refused to disclose the U-2's existence as he believed that the Soviets would demand the end of the flights. In December 1958 Khrushchev boasted that a Soviet missile could deliver a 5-megaton warhead 8,000 miles (13,000 km). Although the Soviets' SS-6 Sapwood missile program was actually stalled due to technical failures, subsequent boasts—and U.S. Secretary of Defense Neil McElroy's statement in February 1959 to Congress that the Soviets might have a three-to-one temporary advantage in ICBMs during the early 1960s—caused widespread concern in the U.S. about the existence of a "missile gap". The American intelligence community was divided, with the CIA suspecting technical delays but the USAF believing that the SS-6 was ready for deployment. Khrushchev continued to exaggerate the Soviet program's success; the missile gap concerns, and CIA and State Department support, caused Eisenhower to reauthorize one Communist territory overflight in July 1959 after 16 months, as well as many ELINT flights along the Soviet border. British U-2 overflights were made in December and February 1960. The first one targeted a large segment of the railways in the Tyuratam test range area as ballistic missiles were expected to be deployed close to rail lines, as well as nuclear complexes and missile test sites. No sites were found. Neither flight proved or disproved the existence of a "missile gap". The British flights' success contributed to Eisenhower's authorization of one overflight in April. By 1960 U-2 pilots were aware, Knutson recalled, that Soviet surface-to-air missiles (SAMs) had improved and that overflights had become much more risky, but did not worry because "dumb fighter pilots always think it's the other guy that's going to get hit". Khrushchev claimed in his memoir that the April flight should have been shot down by new SAMs, but the missile crews were slow to react. By this time, the CIA had concluded internally that Soviet SAMs had "a high probability of successful intercept at 70,000 feet (21,300 m) providing that detection is made in sufficient time to alert the site", and the April flight was tracked quickly. Despite the now much greater risk, the CIA failed to stop the overflights because of overconfidence from the years of successful missions, and because of the strong demand for more missile site photos. By this time, the U-2 was the major source of covert intelligence on the Soviet Union; the aircraft had photographed about 15% of the country, resulting in almost 5,500 separate intelligence reports. Eisenhower authorized one more overflight to occur no later than 1 May, because the important Paris Summit of the Big Four would begin on 16 May. U-2 "GRAND SLAM" flight plan on 1 May 1960, from CIA publication 'The Central Intelligence Agency and Overhead Reconnaissance; The U-2 And Oxcart Programs, 1954–1974', declassified 25 June 2013. 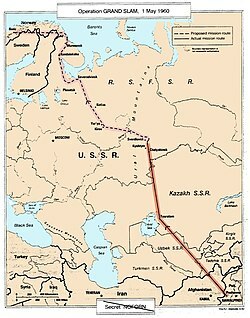 The CIA chose for the mission—the 24th deep-penetration Soviet overflight—Operation GRAND SLAM, an ambitious flight plan for the first crossing of the Soviet Union from Peshawar, Pakistan to Bodø, Norway; previous flights had always exited in the direction from which they had entered. The route would permit visits to Tyuratam, Sverdlovsk, Kirov, Kotlas, Severodvinsk, and Murmansk. It was expected, given good weather, to resolve missile, nuclear and nuclear submarine intelligence issues with one flight. Francis Gary Powers, the most experienced pilot with 27 missions, was chosen for the flight. After delays, the flight began on May Day, 1 May; this was a mistake because as an important Soviet holiday there was much less air traffic than usual. The Soviets began tracking the U-2 15 miles outside the border, and over Sverdlovsk, four and a half hours into the flight, one of three SA-2 missiles detonated behind the aircraft at 70,500 feet; another hit a Soviet interceptor attempting to reach the American aircraft. Powers survived the near miss and was quickly captured; the crash did not destroy the U-2 and the Soviets were able to identify much of the equipment. Bissell and other project officials believed that surviving a U-2 accident from above 70,000 feet was impossible, so they used the preexisting cover story. On 3 May, the National Aeronautics and Space Administration (NASA, the successor to NACA) announced that one of its aircraft, making a high-altitude research flight in Turkey, was missing; the government planned to say, if necessary, that the NASA aircraft had drifted with an incapacitated pilot across the Soviet border. By remaining silent, Khrushchev lured the Americans into reinforcing the cover story until he revealed on 7 May that Powers was alive and had confessed to spying on the Soviet Union. Eisenhower turned down Dulles' offer to resign and publicly took full responsibility for the incident on 11 May; by then all overflights were canceled. The Paris Summit collapsed after Khrushchev, as the first speaker, demanded an apology from the U.S., which Eisenhower refused. U-2 pilots were told if captured, Knutson later said, "to tell them everything that they knew", because they were told little about their missions other than targets on maps. Otherwise, Powers had little instruction on what to do during an interrogation. Although he had been told that he could reveal everything about the aircraft since the Soviets could learn what they wanted from it, Powers did his best to conceal classified information while appearing to cooperate. His trial began on 17 August 1960. Powers—who apologized on advice of his Soviet defense counsel—was sentenced to three years in prison, but on 10 February 1962 the USSR exchanged him and American student Frederic Pryor for Rudolf Abel at Glienicke Bridge between West Berlin and Potsdam, Germany. Two CIA investigations found that Powers had done well during the interrogation and had "complied with his obligations as an American citizen during this period". Although the government was reluctant to reinstate him to the USAF because of its statements that the U-2 program was civilian, it had promised to do so after CIA employment ended. Powers resolved the dilemma by choosing to work for Lockheed as a U-2 pilot. The debris of Powers' aircraft was used to design a copy under the name Beriev S-13. That was then discarded in favor of the MiG-25R and reconnaissance satellites. The search for operational ballistic missile sites would continue focussing on the Soviet railway system using Corona satellite imagery with a resolution of twenty to thirty feet compared to two to three feet from U-2 cameras. The U-2 shootdown in 1960 paralyzed the U.S. reconnaissance community and forced changes in policy, procedures, and security protocol. The United States also had to move swiftly to protect its allies: for example after the Soviets announced that Powers was alive, the CIA evacuated the British pilots from Detachment B as Turkey did not know of their presence in the country. The end of Soviet overflights meant that Detachment B itself soon left Turkey, and in July Detachment C left Japan following a Japanese governmental request. Both detachments merged into Detachment G at Edwards Air Force Base, California, where the CIA had relocated the U-2 program after nuclear testing forced it to abandon Groom Lake in 1957. By the next U-2 flight, in October 1960 over Cuba, the previously informal procedure in which the president personally approved or disapproved each flight after discussion with advisors was replaced by the National Security Council Special Group. The expansion of satellite intelligence partly compensated for the overflights' end, but because U-2 photographs remained superior to satellite imagery, future administrations considered resumption at times, such as during the Berlin Crisis of 1961. From October 1960, Detachment G made many overflights of Cuba from Laughlin Air Force Base, Texas. Although Lockheed modified six CIA aircraft into the aerial refueling-capable U-2F model in 1961, permitting some Cuba missions to originate from Edwards, pilot fatigue limited flights to about 10 hours. An August 1962 flight showed Soviet SA-2 SAM sites on the island; later overflights found more sites and MiG-21 interceptors. The increasing number of SAMs caused the United States to more cautiously plan Cuban overflights. USAF U-2s did not conduct overflights, but officials believed that it would be better for a military officer to be the pilot in case he was shot down. Following one last Cuba overflight that originated from Edwards and ended at McCoy Air Force Base, Florida on 14 October 1962, all further U-2 operations over Cuba originated from a detachment operating location that was established at McCoy. After receiving hasty training on the more-powerful U-2F under the cognizance of the Weather Reconnaissance Squadron Provisional (WRSP-4) at Edwards AFB, Major Richard S. Heyser flew an overflight of western Cuba on 14 October in a U-2F; his was the first to photograph Soviet MRBMs in San Cristobal and he terminated his mission at McCoy AFB, Florida. Prior to launch of all Cuban sorties, the two U-2F aircraft possessed by WSRP-4 and flown by 4080th Strategic Reconnaissance Wing personnel had USAF insignia and tail numbers. SAC received permission to fly as many Cuban overflights as necessary for the duration of the resulting Cuban Missile Crisis. On a 27 October sortie from McCoy AFB, one of the U-2Fs was shot down over Cuba by an SA-2 Guideline surface-to-air missile, killing the pilot, Major Rudolf Anderson; he posthumously received the first Air Force Cross. Fulfilling CIA officials' fears of a USAF takeover, CIA pilots never again flew over Cuba; SAC retained control over Cuban overflights, which continued until the 1970s under the code name OLYMPIC FIRE. At the same time as the Cuban crisis, Royal Air Force English Electric Lightnings of the Air Fighting Development Squadron made several practice interceptions against U-2s; under ground-controlled interception and using energy climb profiles, the Lightning could intercept the U-2 at up to 65,000 ft.
On 28 July 1966, a U-2 piloted by USAF Captain Robert Hickman departed from Barksdale Air Force Base to conduct a reconnaissance mission; Hickman's orders included the requirement that he not enter Cuban airspace. As determined later by Air Force investigators, trouble with the aircraft's oxygen system caused Hickman to lose consciousness. US Navy pilot John Newlin, flying an F-4B assigned to VF-74, was scrambled from Naval Air Station Key West, ordered to intercept Hickman before he violated Cuban airspace, and, if necessary, shoot him down. Newlin could not reach the U-2 before flying closer than 12 miles from the Cuban coastline and so had to turn back. Hickman's U-2 flew across Cuba, ran out of fuel and crashed in Bolivia. Hickman died in the crash. CIA overflights of Asian targets began in spring 1958, when Detachment C moved from Japan to Naval Air Station Cubi Point in the Philippines to overfly Indonesia during an uprising against Sukarno's "Guided Democracy" government. The CIA's Civil Air Transport, aiding the rebels, so badly needed pilots that it borrowed two CIA U-2 pilots despite the high risk to the U-2 program if one were captured. The Indonesian government soon defeated the rebels, however, and the U-2s returned to Japan. That year, Detachment C also flew over the Chinese coast near Quemoy during the Second Taiwan Strait Crisis to see if Communist Chinese forces were preparing to invade, and in 1959 aided CIA operations during the Tibetan uprising. The unit was collecting high altitude air samples to look for evidence of Soviet nuclear tests when it was withdrawn from Asia after the May 1960 U-2 incident. Detachment G pilots began using the unmarked Taiwanese "Detachment H" U-2 for North Vietnam overflights in February 1962, but as tactical intelligence became more important, after the Gulf of Tonkin Resolution of August 1964 SAC took over all U-2 missions in Indochina. In late November 1962, Detachment G was deployed to Takhli Royal Thai Air Force Base, Thailand, to carry out overflights of the Chinese-Indian border area after Indian Prime Minister Jawaharlal Nehru requested military aid following the Sino-Indian War in October–November 1962. In 1963, India agreed to an American request for a permanent U-2 base for Soviet and Chinese targets, offering Charbatia, although it was only briefly used and Takhli remained Department G's main Asian base. After the Vietnamese ceasefire in January 1973 prohibited American military flights, CIA pilots again used the unmarked Detachment H U-2 over North Vietnam during 1973 and 1974. In 1963, the CIA started project Whale Tale to develop carrier-based U-2Gs to overcome range limitations. During development of the capability, CIA pilots took off and landed U-2Gs on the aircraft carrier Ranger and other ships. The U-2G was used only twice operationally. Both flights from Ranger occurred in May 1964 to observe France's development of an atomic bomb test range at Moruroa in French Polynesia. In early 1964, SAC sent a detachment of U-2s from the 4080th to South Vietnam for high altitude reconnaissance missions over North Vietnam. On 5 April 1965, U-2s from the 4028th Strategic Reconnaissance Squadron (SRS) took photos of SAM-2 sites near Hanoi and Haiphong harbor. On 11 February 1966, the 4080th Wing was redesignated the 100th Strategic Reconnaissance Wing (100 SRW) and moved to Davis-Monthan AFB, Arizona. The detachment at Bien Hoa AB, South Vietnam, was redesignated the 349th SRS. At one time, in an effort to extend the U-2's operating range and to eliminate the need for foreign government approval for U-2 operations from USAF bases in foreign countries, it was suggested that the U-2 be operated from aircraft carriers. Three aircraft were converted for carrier operations by the installation of arrester hooks, and carrier-qualified naval aviators were recruited to fly them. It turned out to be possible to take off and land a U-2 from a carrier. Testing in 1964 with the USS Ranger and in 1969 with the USS America proved the concept. The only operational carrier use occurred in May 1964 when a U-2, operating from USS Ranger, was used to spy on a French atomic test in the Pacific. In 1969, the larger U-2Rs were flown from the carrier America. The U-2 carrier program is believed to have been halted after 1969. One of NASA's ER-2s in flight over the California desert. A NASA ER-2 set the world altitude record for its weight class. In August 1970, two U-2Rs were deployed by the National Reconnaissance Office (NRO) to cover the Israeli-Egypt conflict under the code name EVEN STEVEN. In June 1976, the U-2s of the 100 SRW were transferred to the 9th Strategic Reconnaissance Wing (9 SRW) at Beale Air Force Base, California, and merged with SR-71 aircraft operations there. When the Strategic Air Command (SAC) was disbanded in 1992, the wing was transferred to the new Air Combat Command (ACC) and redesignated the 9th Reconnaissance Wing (9 RW). In 1977, a U-2R was retrofitted with an upward-looking window so that it could be used for high altitude astronomical observations of the cosmic microwave background (CMB). This experiment was the first to measure definitively the motion of the galaxy relative to the CMB, and established an upper limit on the rotation of the universe as a whole. In 1984, during a major NATO exercise, Royal Air Force Flight Lieutenant Mike Hale intercepted a U-2 at a height of 66,000 feet (20,100 m), where the aircraft had previously been considered safe from interception. Hale climbed to 88,000 feet (26,800 m) in his Lightning F3. 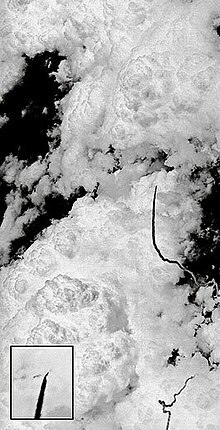 In 1989, a U-2R of 9th Reconnaissance Wing (RW), Detachment 5, flying out of Patrick Air Force Base, Florida successfully photographed a space shuttle launch for NASA to assist in identifying the cause of tile loss during launch, which had been discovered in the initial post-Challenger missions. On 19 November 1998, a NASA ER-2 research aircraft set a world record for altitude of 20,479 meters (67,190 ft) in horizontal flight in the 12,000 to 16,000 kg (26,000 to 35,000 lb) weight class. The U-2 remains in front-line service more than 60 years after its first flight with the current U-2 beginning service in 1980. This is due primarily to its ability to change surveillance objectives on short notice, something that surveillance satellites cannot do. In the mid-1990s, it was converted from the U-2R to the U-2S, receiving the GE F118 turbofan engine. The U-2 outlasted its Mach 3 replacement, the SR-71, which was retired in 1998. A classified budget document approved by the Pentagon on 23 December 2005 called for the U-2's termination no earlier than 2012, with some aircraft being retired by 2007. In January 2006, Secretary of Defense Donald Rumsfeld announced the U-2's pending retirement as a cost cutting measure during a larger reorganization and redefinition of the USAF's mission. Rumsfeld said that this will not impair the USAF's ability to gather intelligence, which will be done by satellites and a growing supply of unmanned RQ-4 Global Hawk reconnaissance aircraft. In 2009, the USAF stated that it planned to extend the U-2 retirement from 2012 until 2014 or later to allow more time to field the RQ-4. Beginning in 2010, the RQ-170 Sentinel began replacing U-2s operating from Osan Air Base, South Korea. Upgrades late in the War in Afghanistan gave the U-2 greater reconnaissance and threat-detection capability. By early 2010, U-2s from the 99th Expeditionary Reconnaissance Squadron had flown over 200 missions in support of Operations Iraqi Freedom and Enduring Freedom, as well as Combined Joint Task Force – Horn of Africa. A U-2 was stationed in Cyprus in March 2011 to help in the enforcement of the no-fly zone over Libya, and a U-2 stationed at Osan Air Base in South Korea was used to provide imagery of the Japanese nuclear reactor damaged by the 11 March 2011 earthquake and tsunami. In May 2014, a U-2 was accused of inadvertently causing an air traffic disruption in the Western US due to an apparent ERAM software glitch. The USAF stated the U-2 did not cause the problem as it did not emit any electronic signals that could have scrambled the control center's computers. The FAA later determined the cause to be a flight plan entry error that overwhelmed the air traffic system's memory capacity. In March 2011, it was projected that the fleet of 32 U-2s would be operated until 2015. In 2014, Lockheed Martin determined that the U-2S fleet has used only one-fifth of its design service life and is one of the youngest fleets within the USAF. In 2011 the USAF intended to replace the U-2 with the RQ-4 before fiscal year 2015; proposed legislation required any replacement to have lower operating costs. In January 2012 the USAF reportedly planned to end the RQ-4 Block 30 program and extend the U-2's service life until 2023. The RQ-4 Block 30 was kept in service due to political pressure over USAF objections, who state that the U-2 costs $2,380 per flight hour compared to the RQ-4's $6,710 as of early 2014. Critics have pointed out that the RQ-4's cameras and sensors are less capable, and a lack of all-weather operating capability; however, some of the U-2's sensors may be installed on the RQ-4. The RQ-4 Block 30's capabilities were planned to match the U-2's by FY 2016, the replacement effort is motivated by decreases in the RQ-4's cost per flying hour. The U-2's retirement was calculated to save $2.2 billion. $1.77 billion will have to be spent over 10 years to enhance the RQ-4, including $500 million on a universal payload adapter to attach U-2 sensors onto the RQ-4. USAF officials fear that retiring the U-2 amid RQ-4 upgrades will create a capability gap; other high-altitude ISR platforms would be used to substitute including satellites and the secretive RQ-170 and RQ-180 UAVs. In the House Armed Services Committee's markup of the FY 2015 budget, language was included prohibiting the use of funds to retire or store the U-2; it also requested a report outlining the transition capabilities from the U-2 to the RQ-4 Block 30 in light of capability gap concerns. In late 2014, Lockheed Martin proposed an unmanned U-2 version with greater payload capability, but the concept did not gain traction with the USAF. In early 2015, the USAF was directed to restart modest funding for the U-2 for operations and research, development, and procurement through to FY 2018. The former head of the USAF Air Combat Command, Gen. Mike Hostage helped extend the U-2S to ensure commanders receive sufficient intelligence, surveillance and reconnaissance (ISR) coverage; stating "it will take eight years before the RQ-4 Global Hawk fleet can support 90% of the coverage of the U-2 fleet. In 2015, the RQ-4 was planned to replace the U-2 by 2019, though Lockheed states the U-2 can remain viable until 2050. As of January 2018, the U.S. Air Force budget for 2018 had indefinitely postponed the retirement of the U-2. On 20 September 2016, a TU-2S trainer crashed upon takeoff from Beale Air Force Base, California, killing one pilot and injuring the other. In early August 2018 NASA flew two missions using infrared sensors to map the Mendocino Complex Fire. The flights used the Moderate Resolution Imaging Spectroradiometer (MODIS) and Advanced Spaceborne Thermal Emission and Reflection Radiometer (ASTER) satellite instruments. Bissell suggested bringing the British into the program to increase the number of overflights. Prime Minister Harold Macmillan agreed with the plan, and four Royal Air Force (RAF) officers were sent to Laughlin Air Force Base in Texas for training in May 1958. On 8 July, the senior British pilot, Squadron Leader Christopher H. Walker, was killed when his U-2 malfunctioned and crashed near Wayside, Texas. This was the first death involving the U-2 and the circumstances were not disclosed for over 50 years. Another pilot was quickly selected and sent to replace Walker. After training, the group of RAF U-2 pilots arrived in Turkey in November 1958, shortly after the CIA's Detachment B from Adana provided valuable intelligence during the 1958 Lebanon crisis with both the United States and United Kingdom involvement. Since the September 1956 disclosure of Mediterranean photographs, the United Kingdom had received U-2 intelligence, except during the Suez Crisis. The CIA and Eisenhower viewed using British pilots as a way of increasing plausible deniability for the flights. The CIA also saw British participation as a way of obtaining additional Soviet overflights that the president would not authorize. The United Kingdom gained the ability to target flights toward areas of the world the United States was less interested in, and possibly avoid another Suez-like interruption of U-2 photographs. Although the RAF unit operated as part of Detachment B, the UK formally received title to the U-2s their pilots would fly, and Eisenhower wrote to Macmillan that because of the separate lines of authority, the nations were conducting "two complementary programs rather than a joint one". A secret MI6 bank account paid the RAF pilots, whose cover was employment with the Met Office. After flying missions over the Middle East the British pilots were declared proficient to fly missions over the Soviet Union. The first British U-2 flight over Russia targeted two missile test ranges, three nuclear complexes and a large segment of railway in one of the test range areas. Operational ballistic missile sites were considered most likely close to railways but none were found. A second flight had as its main target the long-range bomber airfield at Saratov/Engels. The number of Bison long-range aircraft counted on the airfield settled the "bomber gap" controversy. Other targets were a missile test center and aircraft, aircraft engine and missile production plants. A new bomber with two engines at the base of the fin, the Tupolev Tu-22, was discovered at one of the aircraft plants. Like Eisenhower, Macmillan personally approved the Soviet overflights. 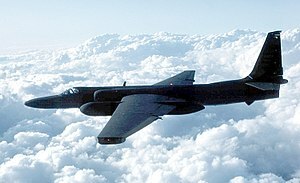 The British direct involvement in overflights ended after the May 1960 U-2 downing incident; although four pilots remained stationed in California until 1974, the CIA's official history of the program stated that "RAF pilots never again conducted another overflight in an Agency U-2." In 1960 and 1961 the first four pilots received the Air Force Cross, but their U-2 experience remained secret. 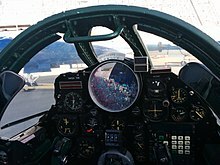 U-2 pilot's view in the cockpit: The large circular monitor is vital for navigation, evading interceptors and Surface-to-Air missiles as early as possible. Since the 1950s, the Republic of China Air Force (ROCAF) had used the RB-57D aircraft for reconnaissance missions over the People's Republic of China (PRC), but suffered two losses when MiG-17s and SA-2 surface-to-air missiles intercepted and downed the aircraft. 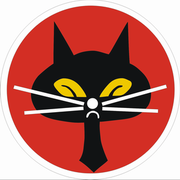 ROC and American authorities reached an agreement in 1958 to create the 35th Squadron, nicknamed the Black Cat Squadron, composed of two U-2Cs in Taoyuan Air Base in northern Taiwan, at an isolated part of the air base. To create misdirection typical of the time, the unit was created under the cover of high altitude weather research missions for ROCAF. To the U.S. government, the 35th Squadron and any U.S. CIA/USAF personnel assigned to the unit were known as Detachment H on all documents. But instead of being under normal USAF control, the project was known as Project Razor, and was run directly by the CIA with USAF assistance. Each of the 35th Squadron's operational missions had to be approved by both the U.S. and the ROC presidents beforehand. A further layer of security and secrecy was enforced by all U.S. military and CIA/government personnel stationed in Taoyuan assigned to Detachment H having been issued official documents and IDs with false names and cover titles as Lockheed employees/representatives in civilian clothes. The ROCAF personnel would never know their U.S. counterparts' real names and rank/titles, or which U.S. government agencies they were dealing with. A total of 26 of 28 ROC pilots sent to the U.S. completed training between 1959 and 1973, at Laughlin Air Force Base, Texas. On 3 August 1959, a U-2 on a training mission out of Laughlin AFB, piloted by ROCAF Major Mike Hua, made a successful unassisted nighttime emergency landing at Cortez, Colorado, that became known as the Miracle at Cortez. Major Hua was awarded the USAF Distinguished Flying Cross for saving the aircraft. In January 1961, the CIA provided the ROC with its first two U-2Cs, and in April the squadron flew its first mission over mainland China. In the wake of the Gary Powers incident, the Taiwanese program of China overflights was redesignated TACKLE, a subset of the new IDEALIST program. Other countries were occasionally overflown by the 35th Squadron, such as North Korea, North Vietnam and Laos; however, the main objective of the 35th Squadron was to conduct reconnaissance missions assessing the PRC's nuclear capabilities. For this purpose, the ROC pilots flew as far as Gansu and other remote regions in northwest China. Some missions, due to mission requirements and range, plus to add some element of surprise, had the 35th Squadron's U-2s flying from or recovered at other U.S. air bases in Southeast Asia and Eastern Asia, such as Kunsan Air Base in South Korea, or Takhli in Thailand. All U.S. airbases in the region were listed as emergency/alternate recovery airfields and could be used besides the 35th Squadron's home base at Taoyuan Air Base in Taiwan. Initially, all film taken by the Black Cat Squadron would be flown to Okinawa or Guam for processing and development, and the U.S. forces would not share any mission photos with ROC. In the late 1960s, the USAF agreed to share complete sets of mission photos and help set up a photo development and interpretation unit at Taoyuan. In 1968, the ROC U-2C/F/G fleet was replaced with the newer U-2R. However, with the overwhelming threats from SA-2 missiles and MiG-21 interceptors, along with the rapprochement between the US and the PRC, the ROC U-2s stopped entering Chinese airspace, only conducting electronic intelligence-gathering and photo-reconnaissance missions using new Long Range Oblique Reconnaissance (LOROP) cameras on the U-2R from above international waters. 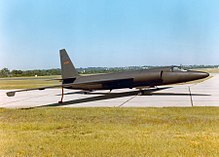 The last U-2 mission over mainland China took place on 16 March 1968. After that, all missions had the U-2 fly outside a buffer zone at least 20 nautical miles (37 km) around China. During his visit to China in 1972, U.S. President Richard Nixon promised the Chinese to cease all reconnaissance missions near and over China, though this was also practical as by 1972, U.S. photo satellites could provide better overhead images without risking losing aircraft and pilots, or provoking international incidents. The last 35th Squadron mission was flown by Sungchou "Mike" Chiu on 24 May 1974. By the end of ROC's U-2 operations, a total of 19 U-2C/F/G/R aircraft had been operated by the 35th Squadron from 1959 to 1974. The squadron flew some 220 missions, with about half over mainland China, resulting in five aircraft shot down, with three fatalities and two pilots captured; one aircraft lost while performing an operational mission off the Chinese coast, with the pilot killed; and another seven aircraft lost in training with six pilots killed. On 29 July 1974, the two remaining U-2R aircraft in ROC possession were flown from Taoyuan Air Base in Taiwan to Edwards AFB, California, US, and turned over to the USAF. Proposed missile warning patrol aircraft; not built. 2 seat used for various IR detection programs, not a trainer aircraft. Two TR-1A airframes, AF Ser. No. 80-1063, and Ser. No. 80-1097, modified as Earth resources research aircraft, moved from USAF to NASA and operated by the NASA High-Altitude Missions Branch, Ames Research Center. NASA flies Ser. No. 80-1097 as N809NA and Ser. No. 80-1063 as N806NA. In May 1961, in an attempt to extend the U-2's already considerable range, Lockheed modified six CIA U-2s and several USAF U-2s with aerial refueling equipment, which allowed the aircraft to receive fuel from either the KC-97 or from the KC-135. This extended the aircraft's range from approximately 4,000 to 8,000 nautical miles (7,400 to 15,000 km) and extended its endurance to more than 14 hours. The J57-powered U-2Bs were re-designated U-2E and the J75-powered U-2Cs were redesignated U-2F. Each modified U-2 also included an additional oxygen cylinder. However, pilot fatigue was not considered, and little use was made of the refueling capability. The only U-2H was both air refueling-capable and carrier-capable. The U-2R, first flown in 1967, is significantly larger and more capable than the original aircraft. A tactical reconnaissance version, the TR-1A, first flew in August 1981. A distinguishing feature of these aircraft is the addition of a large instrumentation "superpod" under each wing. Designed for standoff tactical reconnaissance in Europe, the TR-1A was structurally identical to the U-2R. The 17th Reconnaissance Wing, Royal Air Force Station Alconbury, England used operational TR-1As from 1983 until 1991. The last U-2 and TR-1 aircraft were delivered to the U.S. Air Force in October 1989. In 1992 all TR-1s were re-designated to U-2R for uniformity across the fleet. The two-seat trainer variant of the TR-1, the TR-1B, was redesignated as the TU-2R. After upgrading with the GE F-118-101 engine, the former U-2Rs were designated the U-2S Senior Year. 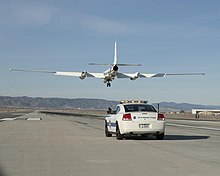 A derivative of the U-2 known as the ER-2 (Earth Resources 2), in NASA's white livery, is based at the Dryden Flight Research Center (now Armstrong Flight Research Center) and is used for high-altitude civilian research including Earth resources, celestial observations, atmospheric chemistry and dynamics, and oceanic processes. Programs using the aircraft include the Airborne Science Program, ERAST and Earth Science Enterprise. Landings are assisted by another pilot at speeds exceeding 120 miles per hour (190 km/h) in a chase car. In August 2015, the 60th anniversary of the U-2 program, Lockheed Martin's Skunk Works revealed they were internally developing a successor to the U-2, referred to as the UQ-2 or RQ-X, combining features from both the manned U-2 and unmanned Northrop Grumman RQ-4 Global Hawk and improving upon them. Disclosed details say the design is essentially an improved U-2 airframe with the same engine, service ceiling, sensors, and cockpit, with the main differences being an optional manning capability (something Lockheed has proposed for the U-2 to the Air Force several times but has never gained traction) and low-observable characteristics. The Air Force has no requirement or timeframe for a next-generation High-Altitude Long Endurance (HALE) platform, but Lockheed sees a future need and wants something in development early. Having the option of an onboard pilot is considered a deterrent because it can be used in peacetime situations where unmanned aircraft would more likely be engaged, since there is no possibility of killing a person. The company's last attempt to create a stealth unmanned aircraft was the RQ-3 DarkStar, which never made it past flight testing and was canceled. Plans for a U-2 replacement would not conflict with development of the SR-72, another project by the company to create a hypersonic unmanned surveillance plane, as it would be suited for missions that require greater speed for time-sensitive targets. The company released a notional artist's impression of the TR-X aircraft at an Air Force Association conference in Washington on 14 September 2015. Its name was changed to mean "tactical reconnaissance" to reflect its purpose as an affordable peace and wartime ISR aircraft, distinguishing it from strategic, penetrating SR-71-class platforms; TR is a reference to the short-lived rebranding of the U-2 as the TR-1 in the 1980s. Size, and thus cost, is kept down by having less endurance than the Global Hawk at around 20 hours, which is still about the same time as a normal RQ-4 sortie even though it is capable of flying for 34 hours. Although originally planned to be optionally-unmanned, some Lockheed officials are leaning towards a purely unmanned aircraft, as it is expected that issues with airspace integration of UAVs will be addressed by the time it will be introduced. The TR-X concept is aimed squarely at Air Force needs, and is not currently being marketed to the CIA or other government agencies. It would have increased power and cooling to accommodate new sensors, communication equipment, electronic warfare suites, and perhaps offensive or defensive laser weapons. TR-X could be ready for service in the 2025 timeframe, with a fleet of 25–30 aircraft proposed to replace the nearly 40-aircraft mix of U-2s and RQ-4s. Lockheed revealed more specifications about the TR-X at a 15 March 2016 media day, confirming the aircraft would be unmanned and air refuelable. Its maximum takeoff weight would be greater than either the U-2's or RQ-4's at around 54,000 lb (24,000 kg), with a 5,000-pound (2,300 kg) payload and 130-foot (40 m) wingspan. It will use the same F118-101 turbofan and generator as the U-2, but thrust could increase to 19,000 pounds (8,600 kg) and power increased to 65–75 kVA; service ceiling would increase to 77,000 ft (23,000 m) with a second engine. The TR-X is meant to be "survivable, not unnoticeable," operating outside of enemy air defense bubbles rather than penetrating into them. U-2/ER-2 on display at the NASA/Moffett Field Museum, Calif.
56-6691 – wreckage is on display at the Military Museum of the Chinese People's Revolution, Beijing. It has been re-assembled and is on display in the aircraft exhibit hall. 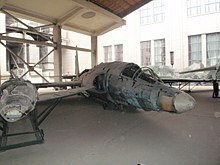 This airframe, flown by the Republic of China Air Force pilot Jack Chang, was downed on 10 January 1965, southwest of Beijing by a S-75 Dvina missile. 56-6676 – wreckage is on display at three museums in Cuba. It was flown by Major Rudolf Anderson, USAF, and was shot down during the Cuban Missile Crisis on 27 October 1962 by a Soviet-supplied S-75 Dvina (NATO designation SA-2 Guideline) surface-to-air missile near Banes, Cuba. One of the engine intakes is at the Museo de la Lucha contra Bandidos in Trinidad. 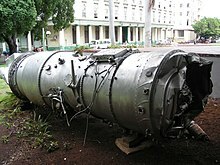 The engine and portion of the tail assembly are at the Museum of the Revolution in Havana. The right wing, a portion of the tail assembly, and front landing gear are at the Fortaleza de San Carlos de la Cabaña, or La Cabaña, Havana. The two latter groups of parts were previously displayed at the Museo del Aire, Havana. 56-6693 – wreckage is on display at the Central Armed Forces Museum, Moscow. It was flown by Francis Gary Powers and was shot down on 1 May 1960 near Sverdlovsk (now Yekaterinburg). 56-6693 – Fort Meade, Maryland, piece of wreckage is on display at the National Cryptologic Museum. It was flown by Gary Powers and was shot down on 1 May 1960 near Sverdlovsk. Presented to the Curator of the U.S. Cryptological Museum by the Russian government during the museum's inauguration. In the 1980s television series Call to Glory, the U-2 was the "main ride" of U.S. Air Force Colonel Raynor Sarnac from the October 1962 Cuba Crisis to 1979. The image of a U-2 was used on the cover of the band Negativland's controversial 1991 EP titled U2. MythBusters featured the U-2 in the "Flights of Fantasy" episode during the 2015 season. The myth tested was that the U-2 was the most difficult plane to fly. While not coming to a consensus, the myth was found to be "plausible", due to, among other things, extremely bad field of vision when landing, which required a chase car to follow the plane upon landing, to give the pilot a set of eyes on the ground. The U-2 Spy Plane appears as a killstreak in Call of Duty: Black Ops, providing players with a radar that periodically reveals the location of enemies. ^ Drew, Christopher (21 March 2010). "U-2 spy plane evades the day of retirement". The New York Times. Retrieved: 23 March 2010. ^ Pedlow and Welzenbach 1992, pp. 4–5, 22. ^ Pedlow and Welzenbach 1992, pp. 5–7. ^ Miller, Herbert L. (Director) "Suggestions re: The intelligence value of Aquatone." Central Intelligence Agency, 17 July 1956. Retrieved: 10 March 2009. ^ Pedlow and Welzenbach 1992, pp. 8–9. ^ Pocock 2005, p. 10. ^ Pedlow and Welzenbach 1992, pp. 8–10. ^ Miller 1995, p. 5. ^ Pedlow and Welzenbach 1992, pp. 11–16. ^ Pedlow and Welzenbach 1992, pp. 24–26. ^ Pedlow and Welzenbach 1992, pp. 29–37. ^ Pedlow and Welzenbach 1992, pp. 39–45. ^ Cefaratt 2002, pp. 78, 158. ^ Pedlow and Welzenbach 1992, pp. 59–62, 66. ^ Pocock 2005, p. 24. ^ a b c d e Huntington, Tom. "U-2." Invention & Technology Magazine, Vol. 22, No. 3. ^ Pedlow and Welzenbach 1992, pp. 54–55. ^ Simms, Christian G. (March 2001). "JP-8+100LT: A low cost replacement of JPTS as the primary fuel for the U-2 aircraft?" (PDF). Air Force Institute of Technology. ^ LaRue, Carl (12 November 2012). "Omega Tau Podcast Episode 109 – Flying the U-2 Dragon Lady" (Interview). Interviewed by Markus Völter. Omega Tau Podcast. ^ Suhler 2009, p. 45. ^ a b c d e f "Sputnik". Cold War. Episode 8. 15 November 1998. CNN. ^ Karl, Jonathan. "So High, So Fast." ABC News, 17 August 2007. Retrieved" 8 March 2009. ^ Donald 1997, pp. 585–586. ^ Donald 2003, p. 7. ^ "U2 Utility Flight Handbook" (PDF). Department of Defense. 1959. p. 129. ^ "High-flying U-2 takes its final bow." Flight International, 29 April 1989, p. 24. ^ Powers, Francis (1960). Operation Overflight: A Memoir of the U-2 Incident. Potomac Books, Inc. p. 18. ISBN 9781574884227. ^ Pedlow and Welzenbach 1992, pp. 75–76. ^ Hennigan, W.J. "New Camaros tear down runway to help U-2 spy planes." Los Angeles Times, 22 November 2012, Retrieved: 8 January 2013. ^ Smith, Sam. "Chasing the U-2 spy plane— in a Pontiac GTO." Popular Mechanics, 28 August 2012. Retrieved: 12 September 2014. ^ Bennett, Christopher W. "The U-2 World, January 1991 – July 1994, May – October 1996. "Blackbirds.net, 16 January 1997. Retrieved: 8 March 2009. ^ a b Norris, Guy. "What do spy plane pilots eat?" Aviation Week 21 August 2015. Retrieved: 7 December 2015. ^ Monchaux, Nicholas De (2011). Spacesuit: Fashioning Apollo. ISBN 9780262015202. ^ Pedlow and Welzenbach 1992, pp. 62–66, 124–25. ^ Polmar 2001, p. 64. ^ Betancourt, Mark. "Killer at 70,000 feet: The occupational hazards of flying the U-2." Air & Space magazine, May 2012, pp. 42–47. ^ Nickel, Shawn, (Senior Airman). "CARE mModifications place pilots at better Eelevation." Archived 5 March 2013 at the Wayback Machine Beale Air Force Base, 13 February 2012. Retrieved: 21 May 2013. ^ Pocock 2005, p. 404. ^ Pedlow and Welzenbach 1992, pp. 60–61. ^ Pedlow and Welzenbach 1992, pp. 73–74. ^ Pedlow and Welzenbach 1992, pp. 59, 74–76. ^ Pocock 2005, p. 406. ^ Pedlow and Welzenbach 1992, pp. 68–71. ^ Pedlow and Welzenbach 1992, pp. 76–79. ^ Pedlow and Welzenbach 1992, pp. 79–80. ^ Pedlow and Welzenbach 1992, pp. 80–88. ^ Pedlow and Welzenbach 1992, pp. 89–90, 156–157, 216. ^ Pedlow and Welzenbach 1992, pp. 93–95. ^ Pedlow and Welzenbach 1992, pp. 96–100. ^ Pedlow and Welzenbach 1992, pp. 100–108. ^ Gummeson, Ray. "RCAF F-86 and U-2 Encounters." (archived) Pinetree Line Website, March 2004. Retrieved: 25 October 2012. ^ Pedlow and Welzenbach 1992, pp. 100–112. ^ Pedlow and Welzenbach 1992, pp. 113–120. ^ Pedlow and Welzenbach 1992, pp. 122–124, 126–128. ^ "Future Plans for Project AQUATONE/OILSTONE." Central Intelligence Agency, 29 July 1957, p. 2. Retrieved: 12 June 2010. ^ Pedlow and Welzenbach 1992, pp. 128–133. ^ Heppenheimer 1998, p. 193. ^ Pedlow and Welzenbach 1992, pp. 135–139. ^ Pedlow and Welzenbach 1992, pp. 143–144, 147–152. ^ West, Nigel (2007). Historical Dictionary of Cold War Counterintelligence. Scarecrow Press. p. 350. ISBN 978-0-8108-6463-4. ^ Smith 2012, pp. 731–732, 734. ^ Pedlow and Welzenbach 1992, pp. 159–168. ^ Pedlow and Welzenbach 1992, pp. 157, 169–172, 316. ^ "The Summit Conference of 1960: An Intelligence Officer's View — Central Intelligence Agency". ^ Pedlow and Welzenbach 1992, pp. 170–177. ^ Pedlow and Welzenbach 1992, pp. 177–181. ^ Pedlow and Welzenbach 1992, pp. 181–186. ^ Yefim Gordon, Sergey & Dmitri Komissarov: U.S. Aircraft in the Soviet Union and Russia. Midland Publishing, 2009, ISBN 978-1-85780-308-2, p. 245. ^ Yefim Gordon: Soviet X-Planes. Midland Publishing, 2000, ISBN 978-1-85780-099-9. ^ a b c d Lashmar, Paul. "Revealed: the RAF's secret Cold War heroes." The Independent, 26 January 1997. Retrieved: 17 August 2013. ^ REDESIGNATION OF CIA PROJECT INVOLVING UTILIZATION OF U-2 AIRCRAFT FOR RECONNAISSANCE PURPOSES AS PROJECT IDEALIST, January 4, 1961, CIA-RDP63-00313A000600070037-9, Central Intelligence Agency. ^ Pedlow and Welzenbach 1992, pp. 181–182, 187–188, 195–197. ^ "U-2 Timeline of Events, 1960s." Blackbirds.net, 7 August 1997. Retrieved: 7 December 2015. ^ Pedlow and Welzenbach 1992, pp. 197–210. ^ Correll, John T. "Airpower and the Cuban Missile Crisis." Air Force Magazine, August 2005. Retrieved: 27 June 2009. ^ a b McLucas, John L. "The Gambit and Hexagon Programs." National Reconnaissance Office, 18 December 1972. Retrieved: 7 December 2015. ^ Pedlow and Welzenbach 1992, pp. 211–220. ^ Pedlow and Welzenbach 1992, pp. 230–234. ^ Raj, Yashwant. "India used US spy planes to map Chinese incursion in Sino-Indian war. "Hindustan Times, 16 August 2013. Retrieved: 7 December 2015. ^ Pedlow and Welzenbach 1992, pp. 246–247. ^ Scott, Jeff. "U-2 Aircraft Carrier Operations." aerospaceweb.org, 28 October 2001. Retrieved: 8 March 2009. ^ Richelson 2006, pp. 212–213. ^ "Operation Fish Hawk – Secret CIA mission – U-2 reconnaissance flight – 1964 French nuclear test on Mururoa Atoll – Article by Kristin Hill". ^ Smoot, G.F., M.V. Gorenstein, and R.A. Muller. "Detection of Anisotropy in the Cosmic Blackbody Radiation. "Physical Review Letters 39, pp. 898–901. ^ Ross, Charles. "Lightning vs Concorde." xr724.org.uk, Lightning Association, 14 November 2004. Retrieved: 13 October 2018. ^ "NASA aircraft sets new world altitude record." Science Daily, 24 October 1998. Retrieved: 8 March 2009. ^ "List of records established by the 'Lockheed Martin ER-2': Database ID 5795". Archived from the original on 10 April 2009. Retrieved 12 September 2008. CS1 maint: BOT: original-url status unknown (link) General Aviation World Records, Fédération Aéronautique Internationale (FAI), Lausanne, Switzerland. Retrieved: 30 June 2011. ^ a b "Five ways the U-2 goes above and sees beyond." Lockheed Martin, 19 February 2014. Retrieved: 13 September 2014. ^ Butler, Amy and David A Fulghum. "USAF not ready to retire the U-2." Archived 8 December 2012 at the Wayback Machine. Aviation Week, 26 August 2008. Retrieved: 10 March 2009. ^ Sherman, Jason and Daniel G Dupont. "DoD cuts Air Force aircraft fleet." Archived 24 February 2008 at Wikiwix Military.com, 11 January 2006. Retrieved: 8 March 2009. ^ Tirpak, John A. "12 Miles High, Changing Course." Arlington, VA: Air Force magazine, Air Force Association, February 2009. Retrieved" 8 March 2009. ^ Min-seok, Kim. "US to base new unmanned spy plane in Korea." Joong Ang Daily, 19 December 2009. Retrieved: 12 December 2011. ^ Evans, Michael (Pentagon Correspondent). "U2 eye-in-the-sky spy plane wins new lease of life in Afghanistan." The Times online, 24 March 2010. Retrieved: 7 December 2015. ^ Sturkol, Scott. "Dragon Lady fires up for another combat mission in Southwest Asia." 380th Air Expeditionary Wing, 29 April 2010. Retrieved: 1 June 2010. ^ Grier, Peter. "Libya intervention: What's the endgame?" The Christian Science Monitor, 21 March 2011. Retrieved: 21 March 2011. ^ Eshel, Tamir. "Satellite imagery, U-2 chart Japan’s earthquake, tsunami devastation." Defense Update, 4 March 2011. Retrieved: 12 December 2011. ^ "https://www.reuters.com/article/2014/05/03/us-usa-airport-losangeles-idUSBREA420AF20140503." Reuters, 3 May 2014. Retrieved: 7 December 2015. ^ Blankstein, Andrew. "Spy place fries air traffic control computers, shuts down Lax." NBC news, 3 May 2014. Retrieved: 7 December 2015. ^ Schogol, Jeff. "Air Force: U-2 did not scramble LAX computers." Military Times, 5 May 2014. Retrieved: 7 December 2015. ^ Scott, Alwyn and Joseph Mann. "Glitch in air traffic control system caused by computer memory shortage, U-2 spy plane." The Huffington Post, 12 May 2014. Retrieved: 7 December 2015. ^ Brook, Tom Vanden. "After Five Decades, The U-2 Is Still Flying High." USA Today, 28 March 2011. Retrieved: 7 December 2015. ^ Majumdar, Dave. "Global Hawk to replace U-2 spy plane in 2015." Air Force Times, 10 August 2011. Retrieved: 22 August 2011. ^ Shalal-Esa, Andrea. "U.S. Air Force to Kill Global Hawk UAV." Aviation Week, 24 January 2012. Retrieved: 24 January 2012. ^ Majumdar, Dave. "Sources: USAF to kill block 30 Global Hawks." Defense News 25 January 2012. Retrieved: 25 January 2012. ^ "Analysts predict A-10, U-2 retirements in FY15." Flightglobal.com, 7 February 2014. Retrieved: 7 December 2015. ^ Sisk, Richard. "Global Hawk trails U-2 despite retirement plans." DoDBuzz.com, 27 February 2014. Retrieved: 7 December 2015. ^ Mehta, Aaron. "Global Hawk saved, but A-10's chances are dim." Defense News, 2 March 2014. Retrieved: 7 December 2015. ^ Mehta, Aaron. "Scrapping U-2 won't save as much as touted." Defense News, 29 March 2014. Retrieved: 7 December 2015. ^ Mehta, Aaron. "HASC markup limits Air Force options on A-10, U-2." Military Times, 5 May 2014. Retrieved: 7 December 2015. ^ Butler, Amy. "Lockheed updates unmanned U-2 concept." Aviation Week, 24 November 2014. Retrieved: 7 December 2015. ^ a b Drew, James. "U-2 poised to receive radar upgrade, but not un-manned conversion." Flightglobal.com, 31 July 2015. Retrieved: 7 December 2015. ^ Butler, Amy.. "2016 budget to bring U-2 stay of execution." Aviation Week, 14 January 2015. Retrieved: 7 December 2015. ^ Clark, Colin. and Sydney J. Freedberg, ed. "Air Force, riding budget boost, warns on sequester; U-2 is BACK!" Breakingdefense.com, 2 February 2015. Retrieved: 25 February 2015. ^ "U2 crash in California". CNN, 20 September 2016. Retrieved: 20 September 2016. ^ Levine, Jay (28 August 2018). "NASA assists in efforts to contain California wildfires". TerraDaily. Edwards AFB CA (SPX): Space Media Network. Retrieved 31 October 2018. ^ Pedlow and Welzenbach 1992, pp. 152–156, 181. ^ Pedlow and Welzenbach 1992, p. 156. ^ Pedlow and Welzenbach 1992, pp. 156–157, 181. ^ "Project RAZOR." Taiwan Air Blog, updated 11 April 2007. Retrieved: 14 September 2009. ^ "Project RAZOR." Taiwan Air Blog, updated 15 April 2007. Retrieved: 14 September 2009. ^ "Taiwan Air Power, U-2 Page, pilots." taiwanairpower.org. Retrieved: 24 February 2010. ^ "U-2 Landing at Cortez (3 August 1959)." cortezeaa1451.org. Retrieved: 12 December 2011. ^ Steves, Bob. "There I was ..." Archived 21 July 2011 at the Wayback Machine Air Force, February 1989. Retrieved: 14 February 2010. ^ Hua, Hsichun M. "A miracle at Cortez." Archived 21 July 2011 at the Wayback Machine Air Force Magazine, August 1989. Retrieved: 14 February 2010. ^ "Target North Korea." Taiwan Air Blog, updated 23 April 2009. Retrieved: 15 September 2009. ^ a b "The End of an Era." Taiwan Air Blog, 7 April 2006. Retrieved: 14 September 2009. ^ "U-2 page: Missions." Taiwan Air Power. Retrieved: 26 December 2009. ^ a b "U2 Operations: Losses." Taiwanpower.org, 21 September 2014. Retrieved: 7 December 2015. ^ "Brief History of U-2." Defence International Taiwan, ROC (全球防衛雜誌), Vol. 35, Issue 5, May 2002. ^ "Lockheed U-2 Dragon Lady: Tactical Reconnaissance." Aerospaceweb. Retrieved: 8 March 2009. ^ Pocock, Chris (2000). The U-2 Spyplane: Toward the Unknown. Atglen, PA: Schiffer Military History. pp. 136–145. ISBN 978-0-7643-1113-0. ^ Polmar 2001, p. 173. ^ Pocock, Chris. "Lockheed U-2C/TR-1/U-2R/S." spyflight.com, 6 January 2008. Retrieved: 8 March 2009. ^ "NASA's white charger to the rescue." NASA Dryden, 21 January 2011. Retrieved: 7 December 2015. ^ Clark, Colin. "Will Lockheed build a stealthy U-2 successor?" Breakingdefense.com, 19 August 2015. Retrieved: 7 December 2015. ^ Drew, James. "Lockheed Skunk Works' next-generation U-2 morphs into 'TR-X'." Flightglobal.com, 14 September 2015. Retrieved: 7 December 2015. ^ Pocock, Chris. "TR-X: The Skunk Works studies a new high-altitude jet." Aviation International News 13 September 2015. Retrieved: 7 December 2015. ^ Malenic, Marina. "AFA 2015: Lockheed Martin pitches TR-X to replace U-2." janes.com', 17 September 2015. Retrieved: 7 December 2015. ^ Jenkins 1998, p. 39. ^ "Maj. Rudolf Anderson Jr." U.S. Air Force. Retrieved: 18 October 2012. ^ "Lockheed U-2/56-6953." Norwegian Aviation Museum. Retrieved: 23 January 2013. ^ "Lockheed U-2/56-6693." Airliners.net, June 2008. Retrieved: 3 June 2011. ^ "Lockheed U-2A" National Museum of the USAF. Retrieved: 5 September 2015. ^ "Lockheed U-2C - Mountain View, California - Static Aircraft Displays on Waymarking.com". www.waymarking.com. 13 April 2017. Retrieved 1 December 2018. ^ "U-2S/TU-2S fact sheet". United States Air Force. 23 September 2015. ^ a b Peter W. Merlin (2015). "Unlimited Horizons: Design and Development of the U-2" (PDF). NASA. ^ a b c d e David M. North (12 April 1999). "Lockheed U-2S pilot report". Aviation Week. p. 60-66. ^ Franklin Fisher (7 January 2010). "U-2s challenge pilots' endurance in the air". Stars and Stripes. ^ "Call to Glory". tv.com. Retrieved: 13 September 2009. ^ Land, Mark. "U-2 (1991)". Negativmailorderland. Retrieved: 22 August 2010. ^ Allain, Rhett. "The physics of some seriously awesome 'MythBusters' stunts". Wired, 30 July 2015. Retrieved: 3 November 2015. Cefaratt, Gill. Lockheed: The People Behind the Story. Nashville, Tennessee: Turner Publishing, 2002. ISBN 978-1-56311-847-0. Donald, David, ed. "U-2 The Second Generation". Black Jets. Westport, Connecticut USA: AIRtime, 2003. ISBN 1-880588-67-6. Donald, David, ed. "Lockheed U-2". The Complete Encyclopedia of World Aircraft. New York: Barnes & Noble Books, 1997. ISBN 0-7607-0592-5. Ellis, Ken. Wrecks & Relics, 22nd ed. Manchester, UK: Crecy Publishing, 2010. ISBN 978-0-85979-150-2. Fensch, Thomas. The CIA and the U-2 Program: 1954–1974. Chula Vista, California USA: New Century Books, 2001. ISBN 0-930751-09-4. Frawley, Gerard. The International Directory of Military Aircraft. Fyshwick, Australia: Aerospace Publications, 2002. ISBN 1-875671-55-2. Heppenheimer, T.A. The Space Shuttle Decision. Washington, DC: NASA, 1998. Hobson, Chris. Vietnam Air Losses, USAF, USN, USMC, Fixed-Wing Aircraft Losses in Southeast Asia 1961–1973. North Branch, Minnesota USA: Specialty Press, 2001. ISBN 1-85780-115-6. Jenkins, Dennis R. Lockheed U-2 Dragon Lady. North Branch, MN USA: Specialty Press, 1998. ISBN 1-58007-009-4.
. Joss, John, "Flying the U-2," FLYING magazine, April 1977. Miller, Jay. Lockheed Martin's Skunk Works: The Official History… (upd. ed.) Leicester, UK: Midland Publishing, 1995. ISBN 1-85780-037-0. North, David M. Flying the U-2. North, David M. Pilot selection process arduous. Pedlow, Gregory W. & Donald E Welzenbach. The Central Intelligence Agency and Overhead Reconnaissance: The U-2 and Oxcart Programs, 1954–1974. Washington, DC: Central Intelligence Agency, 1992. ISBN 0-7881-8326-5. Pocock, Chris. 50 Years of the U-2: The Complete Illustrated History of Lockheed's Legendary Dragon Lady. Atglen, Pennsylvania USA: Schiffer Publishers, 2005. ISBN 0-7643-2346-6. Pocock, Chris. The U-2 Spyplane: Toward the Unknown. Atglen, Pennsylvania USA: Schiffer Publishers, 2000. ISBN 0-7643-1113-1. Polmar, Norman. Spyplane: The U-2 History Declassified. St. Paul, Minnesota USA: Zenith Imprint, 2001. ISBN 0-7603-0957-4. Richelson, Jeffrey T. Spying on the Bomb: American Nuclear Intelligence from Nazi Germany to Iran and North Korea. New York: WW Norton & Co, 2006. ISBN 978-0-393-05383-8. Smith, Jean Edward. Eisenhower in War and Peace. New York: Random House, 2012. ISBN 978-0-679-64429-3. Suhler, Paul A. From Rainbow to Gusto: Stealth and the Design of the Lockheed Blackbird. Reston, Virginia: American Institute of Aeronautics and Astronautics, 2009. ISBN 1-60086-712-X.